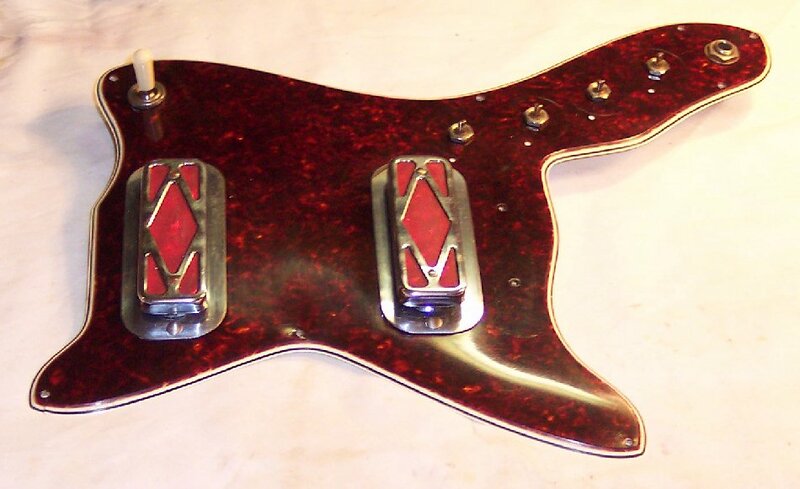 The pickguard has been compound polished and is shown here after a light oil has been applied to soak in and replenish surface oils lost to aging evaporation. Excess oil will be wiped off before installing upon the guitar. The elevated pickups were cleaned, oil-misted and shined, reaching between the base plates and pickups with artist brushes and Q-tips. All hardware fittings were cleaned and then wiped with oil-misted applicators. Here the previous separated cracks around this screw are shown repaired. 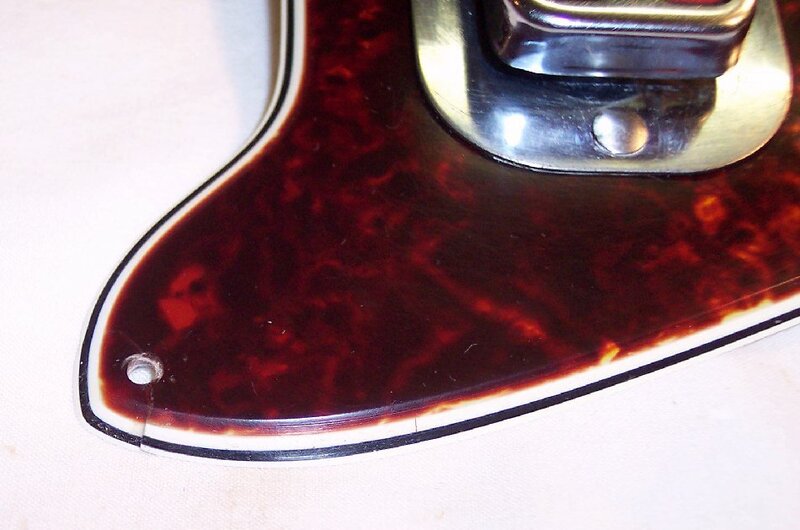 These corners are often torn off as the acetate pickguard shrinks over time. In this pickguard's case the corner had not torn loose but was well on it's way to doing so. This corner had warped slightly, curved upward due to the slow migration of tension on it by the screws as they tilt inward as the pickguard shrinks over time. When I rejoined the cracks in a closed fit, the edge on the right side of the crack was warped higher than the left side of the crack. I sanded, compouned and polished the repair level on top and along the side bevel, leaving a slight misalignment of the laminates; As good a fit as could be done without extensive delaminating surgery and implanting faux plastic laminates made from epoxy. Here the back side of the repair is reinforced with super glue impregnated into plastic sanding dust, then sanded down and compounded; Leaving a layer of reinforcement that will resist any further expansion forces upon the repaired crack. I slightly elongated all the pickguard screw holes to relieve the pickguard's shrinkage tension upon the screws. 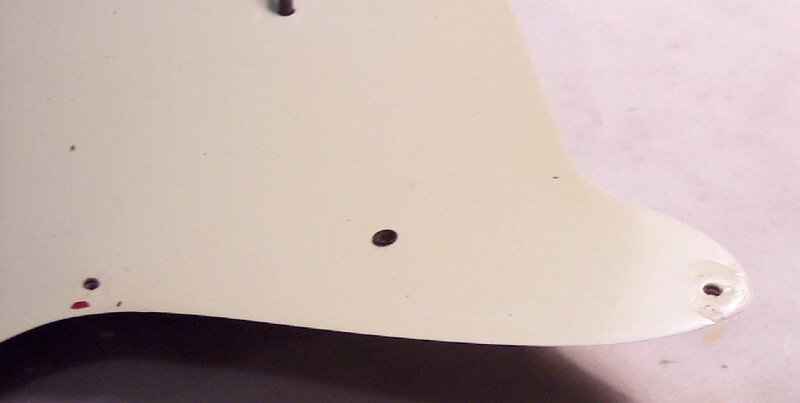 The crack repair hole was elongated first and an original round hole is on the lower left side of this picture (the larger dark dot is the rivet securing the neck pickup). 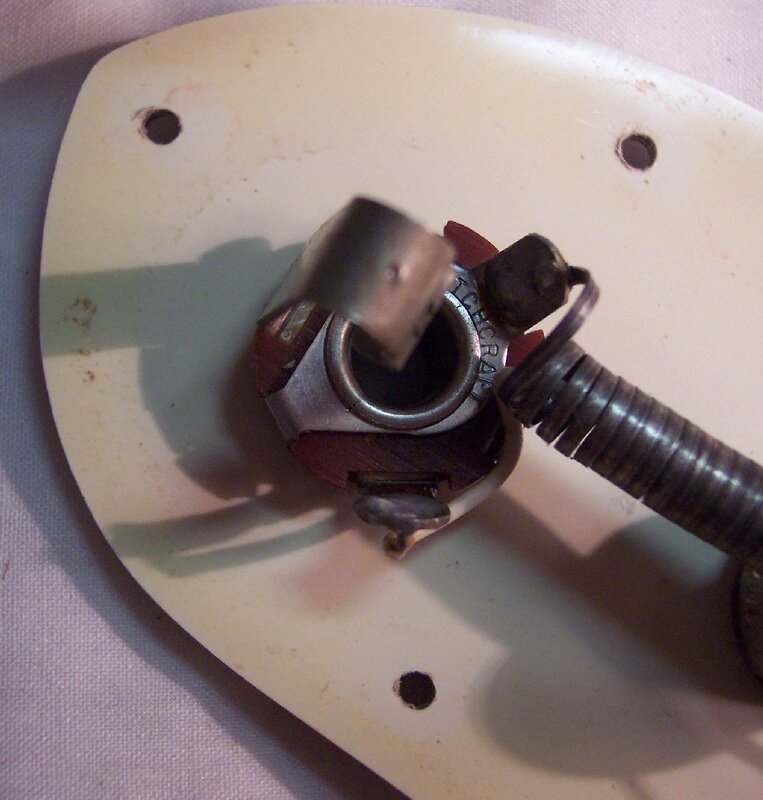 Here the 3 screw holes around the jack are shown slightly elongated in the direction the pickguard shrinkage pulls upon the screws. The holes have not yet been cleaned out nicely in this pic. The pickguard is now finished and ready to be installed. Cleaning up the roller bridge will take about an hour and leave all parts ready for reassembling the guitar.